It started off with school proms and baby showers, and Black Friday is yet another American tradition that’s made its way to Britain, with this year is set to be the biggest yet! It’s hard to forget the scenes that unfolded when Black Friday first arrived in the UK, bringing out the aggression in customers as they tried their hardest to get their hands on a bargain TV. The first Black Friday event in the UK was so chaotic that it left a lot of brands feeling unconvinced by its value, with some going as far as pulling out of the event altogether. 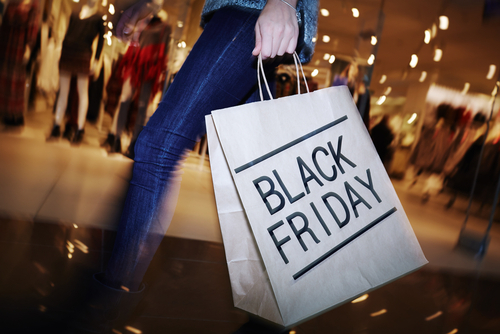 However over the last three years, Black Friday has changed significantly, becoming one of the biggest shopping events in the UK calendar. According to Marketing Week, today’s Black Friday is set to be the biggest yet, with nearly a quarter of all Christmas gifts expected to be purchased and shoppers predicted to spend £2.31m a minute. Brands have tried to get ahead of the game this year, with the likes of Currys PC World and Car Phone warehouse increasing the number of delivery trucks on the road, stock levels and number of staff. Black Friday, originally a one day only event, has evolved with many brands extending offers across the whole weekend. Debenhams has well and truly got into the spirit this year, by releasing different offers every day of the week leading up to the event. But do the offers really live up to the hype of the Black Friday event? We must admit one or two of us in the office may have stayed up until midnight especially, but went to bed feeling a little underwhelmed and very tired this morning!